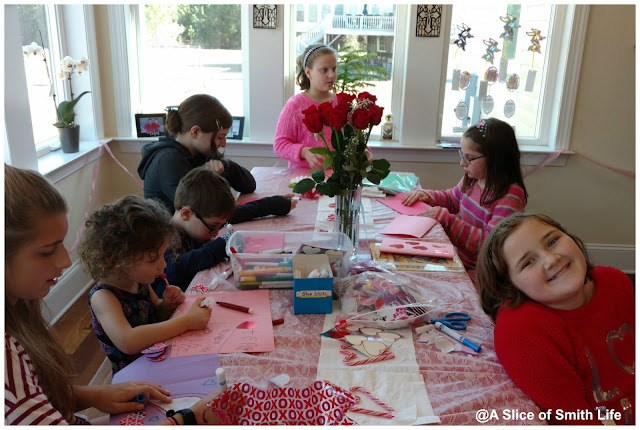 Today we celebrated Saint Valentine's Day with friends from our local homeschool group. 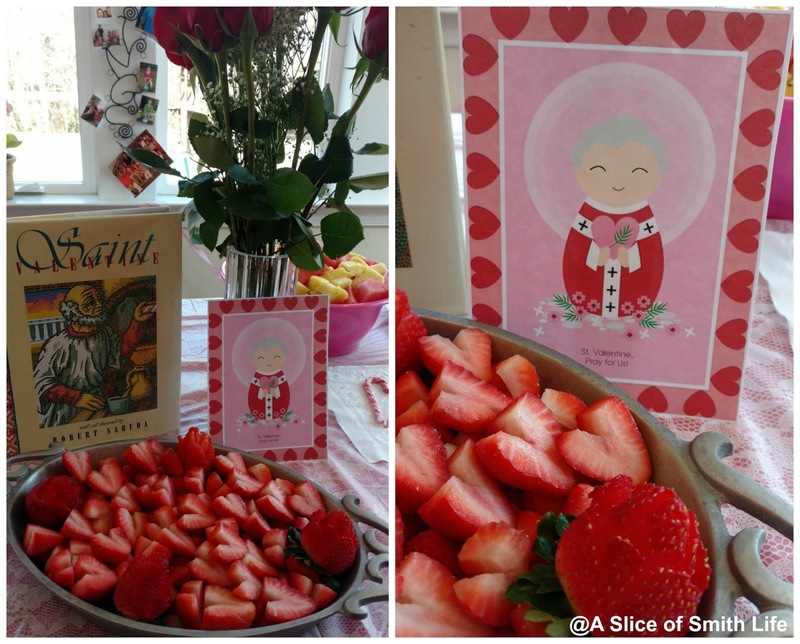 It was a beautiful day to celebrate Saint Valentine, a servant of God, who was persecuted for his Christian faith and beheaded (yikes!) on February 14, 270. 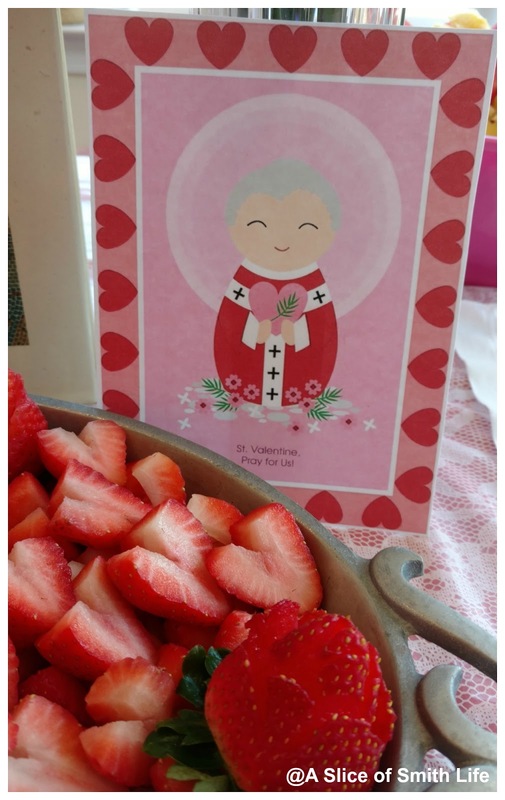 To read a lovely post and and prayer to Saint Valentine written by a friend's husband, be sure to visit Cecily's post at Cloudy Symbols of High Romance. 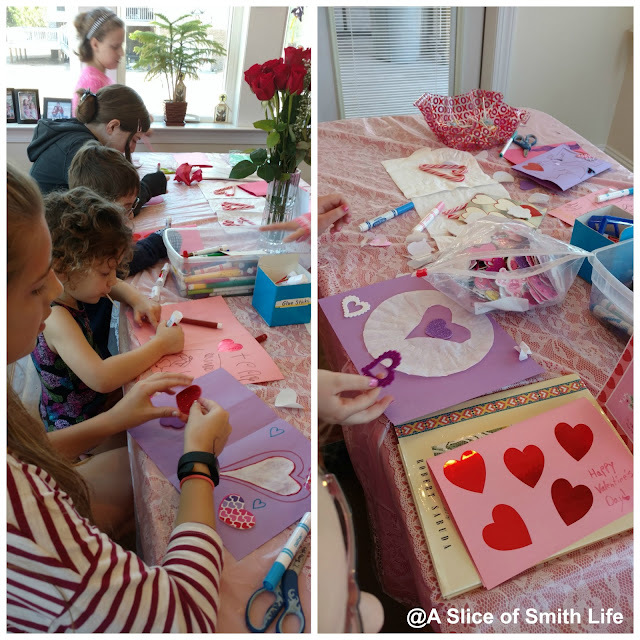 Aren't her daughters homemade Valentines the sweetest?!? Such beautiful, heartfelt traditions the lovely Lowmans have! I was inspired by this video that I found via Facebook that had lots of simple food ideas for Valentine's Day. 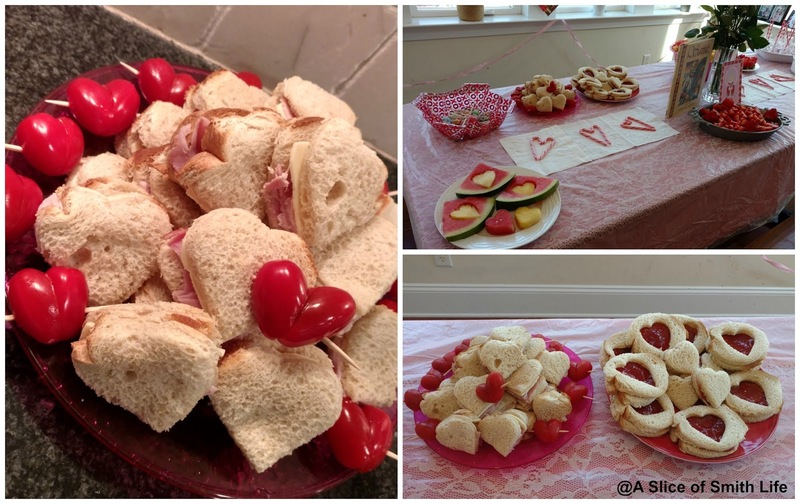 So I brought out my heart-shaped cookie cutters and a few of my kids and I prepared 10 simple foods for our Valentine's Day party! When the guests arrived my kitchen table was decorated with a plastic red tablecloth under a plastic lace tablecloth. 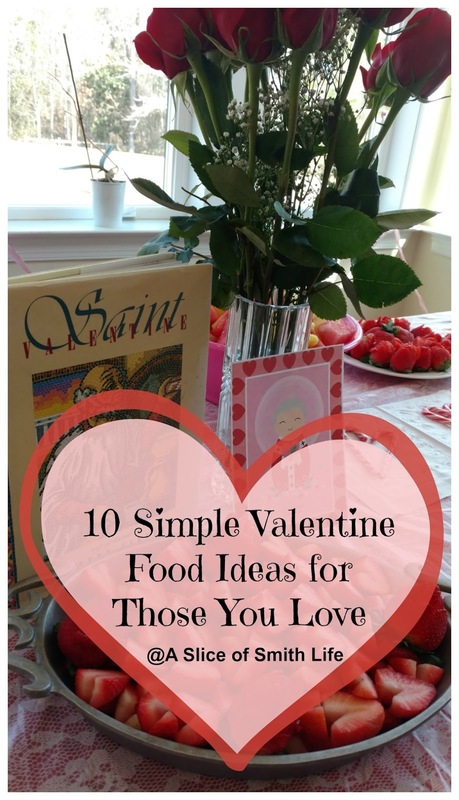 On the table I had the food set out and a bouquet of red roses my sweet husband gave me. We read the book Saint Valentine that is a family favorite during our morning Couch Catechism time and I printed out a Saint Valentine graphic from Shining Light Dolls Facebook page onto white cardstock. 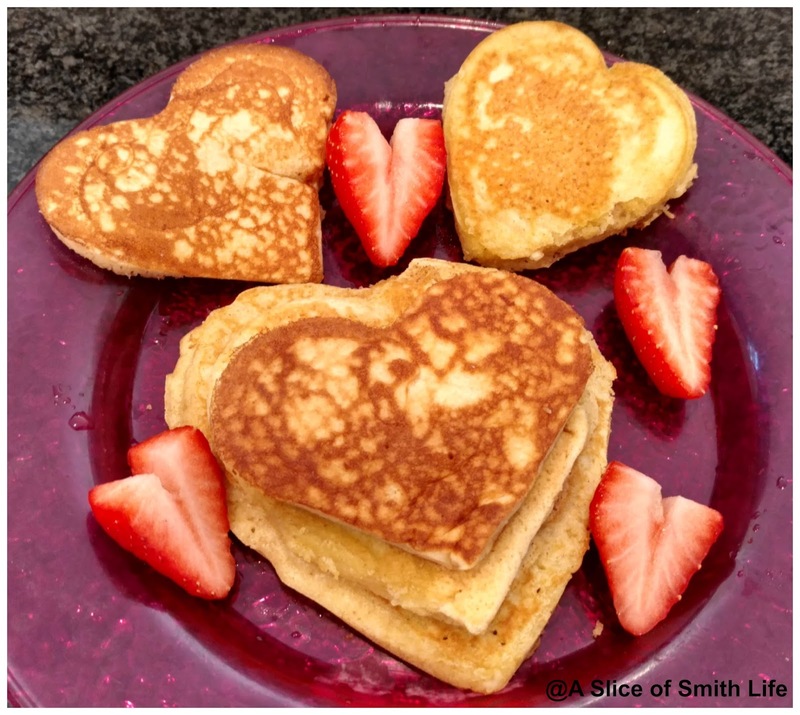 We made heart-shaped pancakes for breakfast before the party using our cookie cutters as molds. 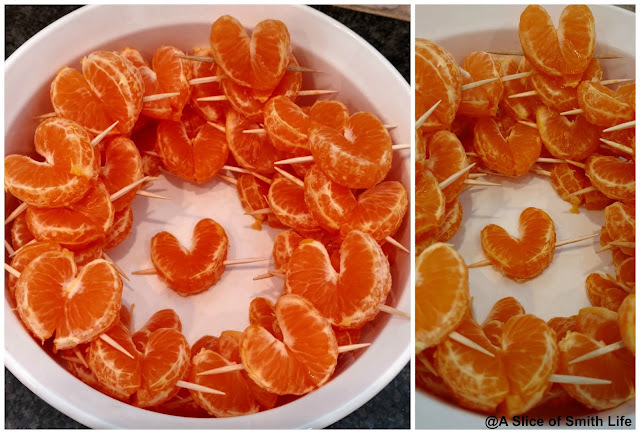 We added some heart-shaped strawberries. I've been making the heart-shaped strawberries for awhile now, but then I saw how to make roses from strawberries (see this video). I loved this idea that is really easy to do once you get the hang of it! My 9 year old even made a few. 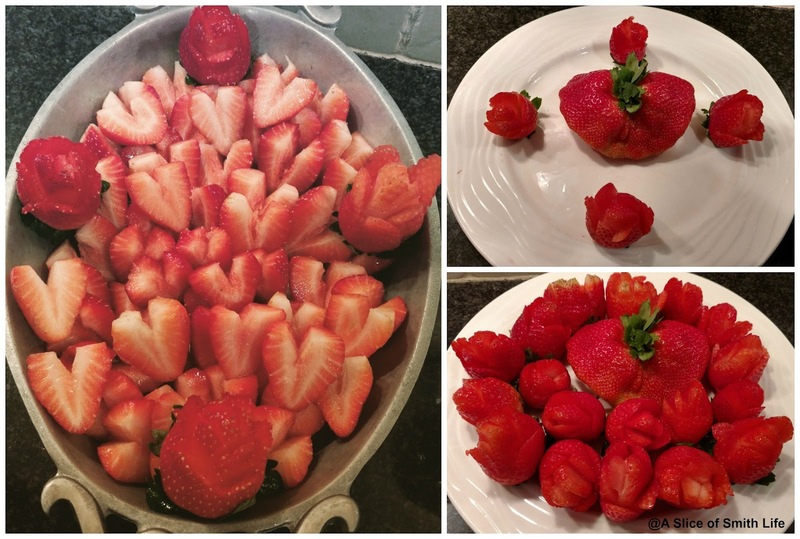 One of our packages of strawberries had a huge strawberry buried in the container. It reminded me of Jesus' Sacred Heart. 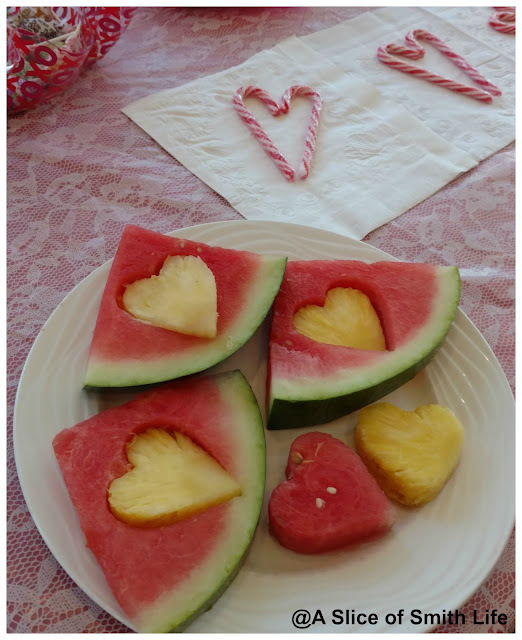 I only made a few of the heart-shaped watermelon/pineapple (because my cookie cutter wouldn't cut through and it's messy) and cut up the rest and put it into a bowl (see this video). 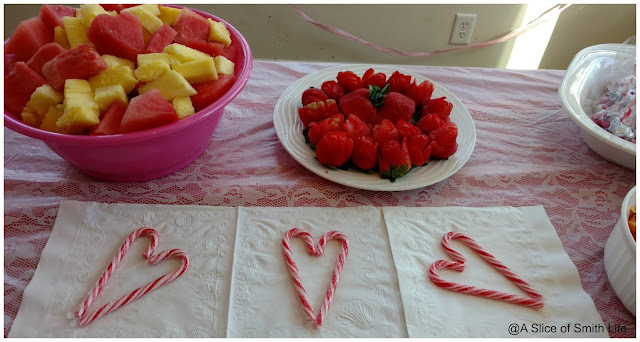 I had a small box of candy canes leftover from Christmas so I just laid them in a heart shape as part of the table decorations. 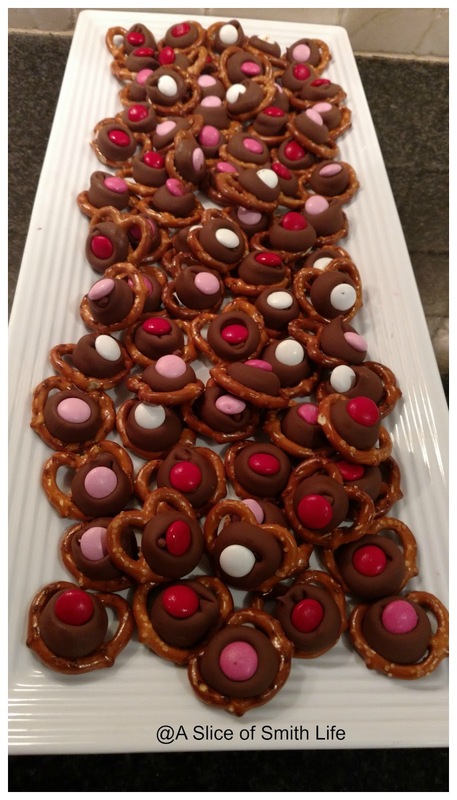 I've made these pretzel treats year round for Christmas and Easter using the corresponding holiday M&Ms. They are a family and friends favorite any time of year! When the guests arrived they decorated homemade Valentine's Day cards for friends family using coffee filters with a cut out heart in the middle like we did several years ago. 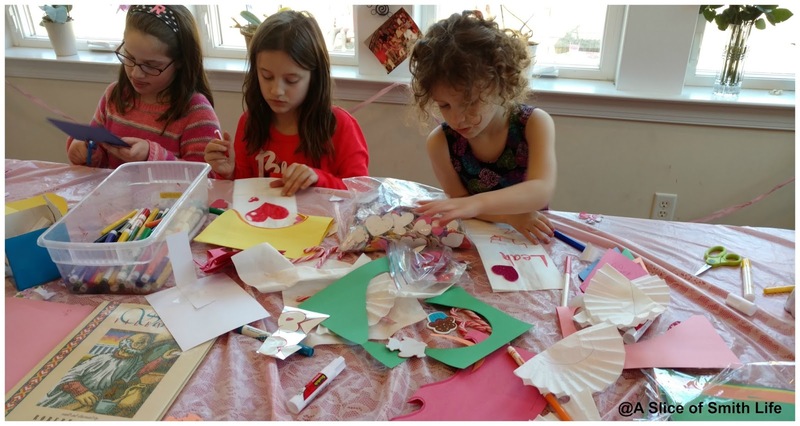 The children also made their bags to collect Valentines from friends. We then ate lunch and one of our teens made a beautiful chocolate cake and a family brought bags of popcorn in decorative bags. 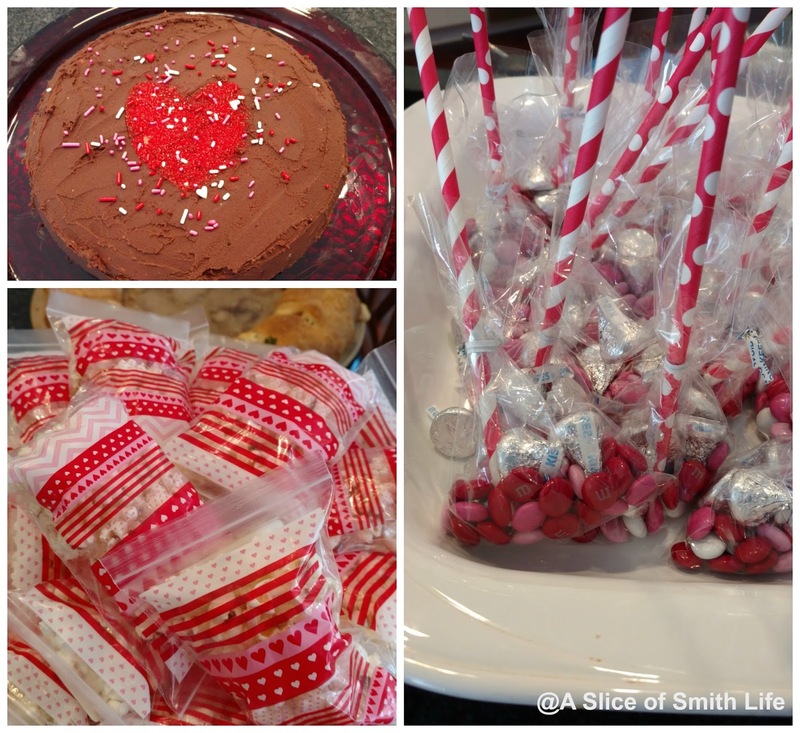 One of my daughters and I made treat bags with M&Ms, Hershey kisses and decorative straws. 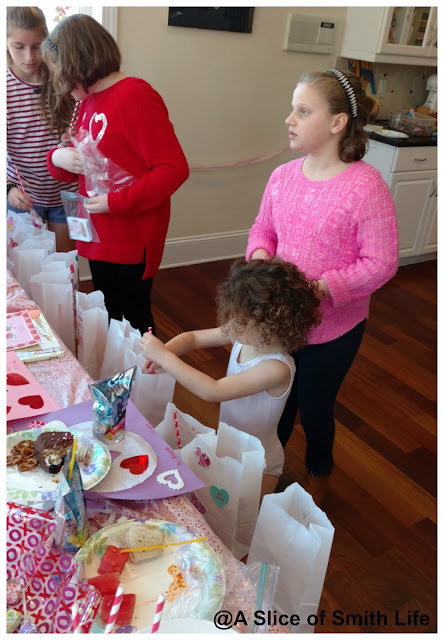 When the eating was done and the bags were decorated, it was time to deliver Valentines to our friends! It was a blessed day to remember such a faithful and strong witness to the Catholic faith! 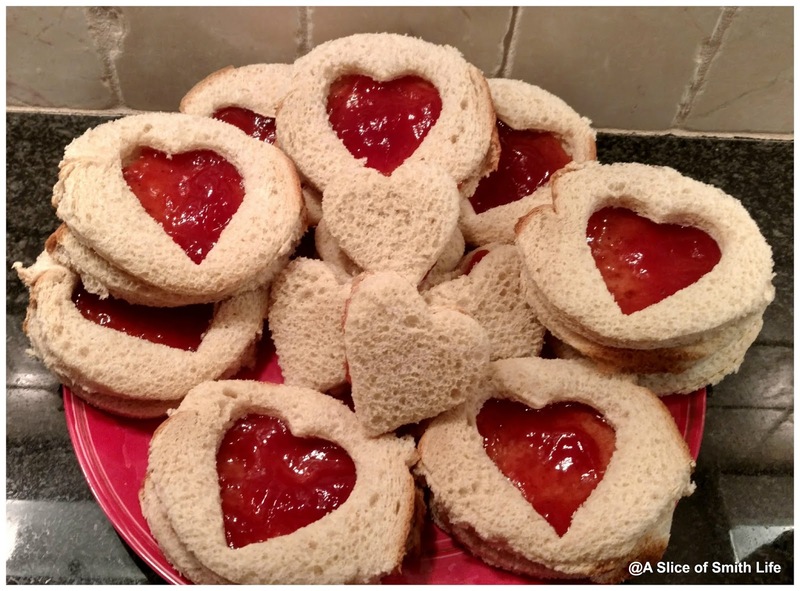 To see more Valentine posts from years past, be sure to visit my A Slice of Liturgical Life page! Thanks always for your visits and kind comments! Thanks for pinning!